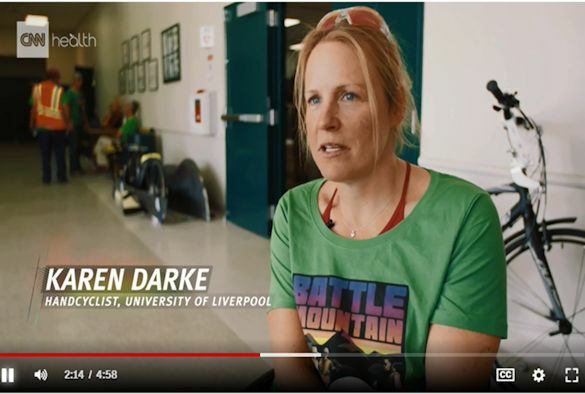 The record breaking achievements of the University’s Engineering students, their recumbent hand cycle ARION4, and their riders, Karen Darke MBE and Ken Talbot, are part of a special feature broadcast on CNN. the ULV Team were filmed in September when they competed in the World Human Powered Speed Challenge which takes place every year on Route 305, the flattest, longest, smoothest and straightest road in central Nevada. The film footage provides an insight into the determination, passion and competitiveness of the world of the human powered challenge. Featuring interviews with the competition organisers, with other teams and with ARION4’s record-breaking cyclists Ken and Karen, there is also footage of Karen and Ken being announced as the new hand cycling world record holders. During the 2018 competition Karen Darke MBE smashed the female world hand cycling record achieving a speed of 46.54 mph on the 5 mile course. Ken Talbot, recorded a speed of 51.86 mph on the 5 mile course, breaking the male world record and becoming the first hand cyclist to go over 50 mph in history. This is the fourth year running that Engineering students from the University have taken part in the World Human Powered Speed Challenge. In previous years, the teams have designed and built aerodynamic recumbent bikes (ARION1,2 and 3) which used leg power.